Once the bark is taken off the tree the wood has no way of protecting itself. The damaging effects of weather to unprotected wood can begin immediately. Rain, moisture and morning dew are quickly absorbed by unprotected wood causing it to swell. The sun’s heat causes drying, which makes the wood shrink. These cycles of wet and dry, swelling and shrinking, cause wood to warp, split, cup and crack – all of which lead to shortened wood life and expensive repairs and replacement. Having your wood cleaned and sealed/stained by Straighline Powerwashing, can double the life of your wood and make your decks & fences look like new again. We provide a free evaluation of your wood to determine if it is restorable. In some cases the wood has deteriorated too badly to be restored. If the wood is restorable, we provide a written bid explaining all the work to be done. If needed, we begin by removing the old sealer/stain with a stripping solution to remove any paint,stains or sealers previously applied to the wood. This process is environmentally friendly and will not harm your pets, plants or grass. 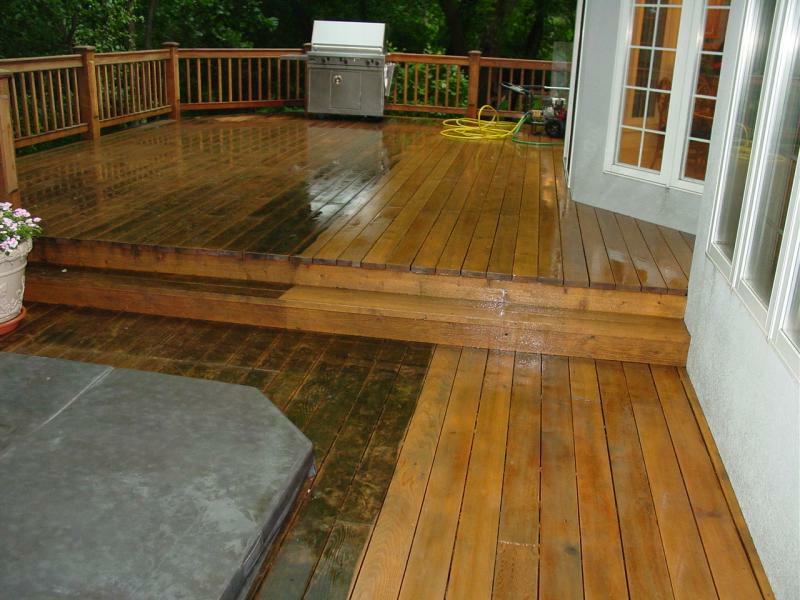 Next, we powerwash your wood with 1500-2500 PSI water depending on the severity & condition of wood. The wood is then treated with a neutralizing agent that will brighten the wood and prepare it for our sealer/stain. We then let the wood dry to a moisture content of no more than 10%. We at My Three Sons Landscaping sand all of your seating surfaces and hand rails. We then seal/stain your wood by hand with a penetrating oil based semi-transparent sealer/stain that will never crack or peel. The sealer/stain protects your wood from the sun’s harmful UV rays, resists algae and moss, and repels water.